“We tried to reduce everything to the necessary minimum,” said mCubed Information Technology GmbH’s Managing Director, Maik Berendt. mCubed’s submission for the Intel Core Processor Challenge PC Design, the aluminum and acrylic HFX micro, uses an Intel Core 2 Duo processor and a fanless, noiseless cooling system of integrated heatsinks and heatpipes. 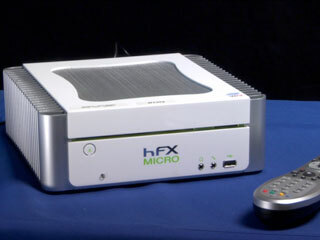 With a total volume of only 4.4 liters, the small, sleek and silent HFX micro could be your People’s Choice.